The one variable that may have impacted the results is that our weekend programming does consist of 13 hours of syndicated programming. Open House Party, a live, nationwide request program, airs on both Saturday and Sunday night for 5 hours, and on Sunday morning, we air a three-hour national countdown hosted by Carson Daly. But, on the whole, the results reflect any given hour of listening to 97.5 NOW FM. So what does it mean? Well, in part, it means that despite what's happening nationally, we're doing our own thing in a lot of respects. Notice that the nationally-ranked #3, #4, #6, #8, #9 and #10 songs don't show up anywhere on our top ten list. Meanwhile, songs ranked #35 and #21 nationally, are among our most-played -- because YOU (Lansing) want to hear them! 1. #5 - Flo Rida "My House"
2. #2 - Twenty One Pilots "Stressed Out"
3. #1 - Justin Bieber "Love Yourself"
4. #11 - Adele "When We Were Young"
5. #12 - Charlie Puth "One Call Away"
6. #21 - Rachel Platten "Stand By You"
7. #17 - Mike Posner "I Took A Pill In Ibiza"
8. #13 - Rihanna f/Drake "Work"
9. #7 - Selena Gomez "Hands to Myself"
10. #35 - One Direction "History"
#3 - The Chainsmokers "Roses"
#4 - The Weeknd "In The Night"
#6 - Justin Bieber "Sorry"
#8 - Daya "Hide Away"
#9 - DNCE "Cake By The Ocean"
#10 - G-Eazy f/Bebe Rexha "Me, Myself & I"
They're all songs that you can hear on 97.5 NOW FM, but either they haven't quite resonated here like they have in other parts of the country OR they peaked here before they peaked nationally. An example of the latter is Daya's "Hide Away," which we first started playing in the early fall months of 2015. Then, she appeared at our Pink Tie Affair in October. Her song was on fire in Lansing long before it landed in the national top 10! So there you go... just in case you ever wondered if we're listening when you make a request or tweet at us or take our music survey. We're listening and your input makes a HUGE difference! Lansing!  YOUR music is ON... 97.5 NOW FM!